Recently, at work, I had to give an impromptu lesson on Mardi Gras and Lent. Mardi Gras is French for “Fat Tuesday,” and Fat Tuesday is considered the last day of "Carnival." The Carnival season includes feasting, dancing, and, sometimes, drunkenness and debauchery. In general, Mardi Gras revelers engage in a binge of sinning before a time of consecration to God during the Christian Lenten season, which begins the day after Fat Tuesday. The Carnival celebration fosters the notion for some that they can do whatever they want, as long as they show up in church on Ash Wednesday. It’s the bender before the benediction. Ash Wednesday signifies the beginning of Lent, a 40-day time period of fasting and restitution in preparation for the Easter holiday. Members of the many Christian denominations practice various acts of spiritual self-discipline during Lent. Notably, Catholics abstain from meat on Fridays. During the Lenten season, what better for a Friday night than a meatless pizza? Here is a recipe for one of my all-time favorites. Heat the grill to high or turn on the broiler. 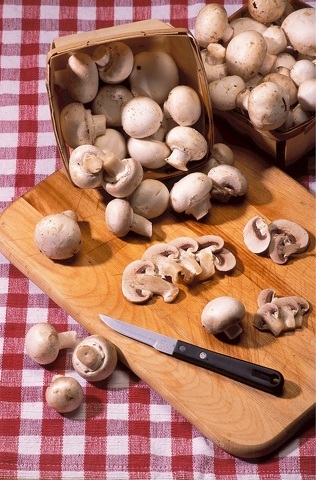 Place mushrooms in a large mixing bowl with the canola oil and season with salt and pepper. Place the mushrooms on the grill or on a foil-lined cookie sheet under the broiler, cap side down, and grill/cook until golden brown and slightly charred, 4 to 5 minutes. Turn the caps over and continue cooking until the mushrooms are cooked through, about 5 minutes longer. Remove from heat and let cool. Once cool to the touch, coarsely chop in a food processor. Combine chopped mushrooms with butter, garlic and toasted walnuts in food processor and process until finely chopped. With the motor running, slowly add 1/2 cup of olive oil and process until smooth. Add 1/4 cup of pecorino cheese and pulse to incorporate until it has reached a thickened pesto texture. Season with salt and pepper. Split the loaf of bread lengthwise and across in half. Hollow out a bit of the soft inside and brush the bread on the cut side with the remaining 1/4 cup of olive oil. Season with salt and pepper. Evenly spread the mushroom pesto over the cut side of each half of bread. Top the pesto with the shredded Gruyere and grated fontina, return to the grill or broiler and cook until the cheese has melted, about 2 minutes. Remove from the grill and sprinkle with the remaining Romano, if desired.